I'm often reminded how lucky I am to have grown up a reader in a country like Australia, where there are so many writers publishing complex and diverse books particularly for young people. Some would argue that on the diversity front, we aren't quite there yet, but through important discussions I see happening every day on social media and at conferences in the non-virtual world, I believe that the YA genre will probably be the first to get there. Far from being navel-gazing stories which would only interest teenagers, novels in the YA genre deal with issues which affect people of all ages, but look at them through the eyes of teen protagonists, who are often observers to difficult situations but don't always get a chance to make their voices heard. Clancy of the Undertow by Brisbane writer and bookseller Christopher Currie is a shining example of the power of Young Adult literature. Whilst reading it, I was reminded of many other great YA novels; those of John Marsden, Vikki Wakefield, and even of my favourite book of all time, Jasper Jones by Craig Silvey. 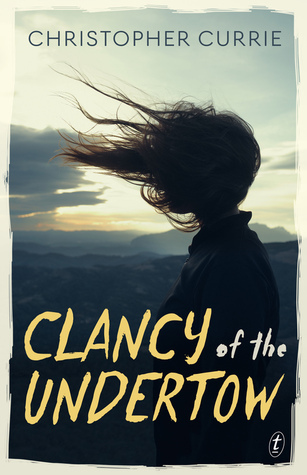 The protagonist, Clancy, finds her life turned inside out after an accident kills two of Barwen's elite and popular students and it seems like her father may have had some fault in the incident. Clancy already feels like an outcast in Barwen (rural Queensland), and doesn't have many friends. Her father has been struggling since an accident at work left him with a back injury and her mother had to work extra hours as a substitute teacher to keep the family afloat. Clancy is the middle child, and her older brother Angus has just moved home again after an unsuccessful stint at a University. He now seems content to drift, searching for mythological animals in his spare time, and basically just embarrassing Clancy. Clancy's voice is sassy and genuine, and the use of a first person, present tense voice worked really nicely for this story. 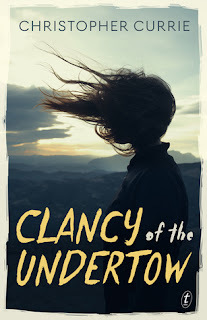 As Clancy's situation grew worse and worse, I found myself identifying with her strongly, reaching a point around 70 or so pages in where I felt so strongly for her that I wanted to cry. There are also some beautiful moments of joy and hope in the book, and Currie does a fantastic job of developing the supporting characters in a way that makes Clancy's Barwen feel like a real place. While the story does feel Australian, there's nothing cheesy or overdone about it. I also have to applaud the lack of insincerity to the teenage aspects of the novel; in so many novels with contemporary settings and teen characters, it's easy to feel like you're bearing witness to a parade of first world problems. But Clancy's problems are real, and what's more, Clancy is real and you care about her. What is particularly well done (and I don't think that this counts as a spoiler, because it's on the back cover) is the question of Clancy's sexuality. While from the get go, the reader is aware that the protagonist is gay, the character herself doesn't feel like she needs to come out and do a monologue about it. It becomes clear in her actions and her thoughts because it's part of who she is. I think this is something a lot of writers could learn from. When it comes to diversity in books, perhaps in particular when the person writing the book is from a heterosexual or cisgendered background, there's this sort of impulse to explain the difference about the character's sexual orientation that never feels quite right. I don't imagine that LGBTQ+ people in real life go around thinking "I am gay, and therefore I am attracted to this person" so why should the characters? The development of Clancy's character, and this aspect of it, follows a beautiful arc which is in harmony with the rising tension of the story line and I really enjoyed spending time with her. I think I have learned a lot from reading this book. I won't go into too much more detail, but I will say read this book. No matter what age you are, read it, it's wonderful and engaging and I could hardly bear to put it down to go to work. I gave it five stars.